Animators and filmmakers first used the method of storyboarding. It pre-visualizes a motion picture or interactive media sequence. Walt Disney Productions developed the process itself in the early 1930s. The word “storyboard” comes from pinning the images of the story to a board. It allows for easy changes to the individual images and shots during the filmmaking process. See how Pixar used storyboarding while making Toy Story in this great example of awesome storytelling. Storyboarding also easily communicates the basic shots, scenes, camera movement and plot with the whole animation team. Some filmmakers and directors also use it to visualize movie shots. 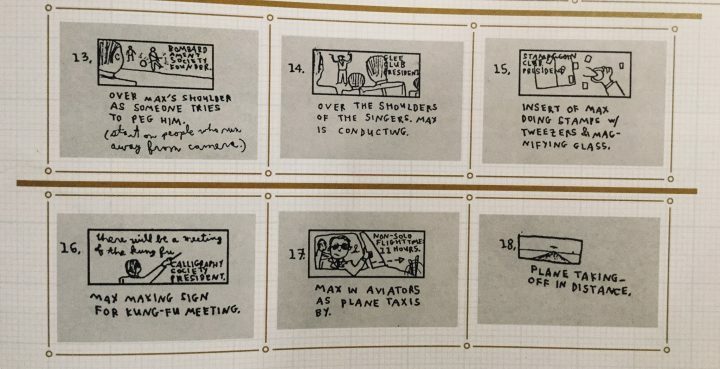 One of my favorite notorious storyboard drawers is Wes Anderson. Matt Zoller Seitz included a ton of these drawings in his book, The Wes Anderson Collection. That Anderson had the exact shots in his head even at a very early stage of the film production just amazes me. So storyboards help filmmakers and animators a lot. How can they help product managers and UX designers? The UX storyboard can help visually predict and explore the user experience with a product. It visualizes how people would interact with a service or app. 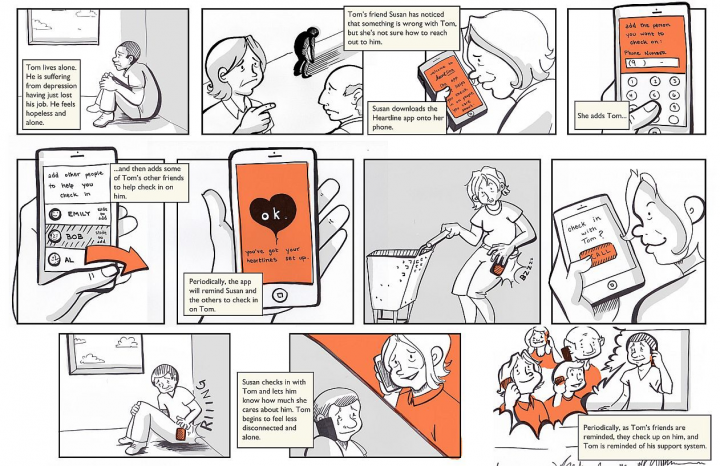 A UX storyboard can also help understand users current motivations and experiences connected to a certain problem. We have personas and journeys. Why a UX storyboard too? They have some indisputable additional benefits. 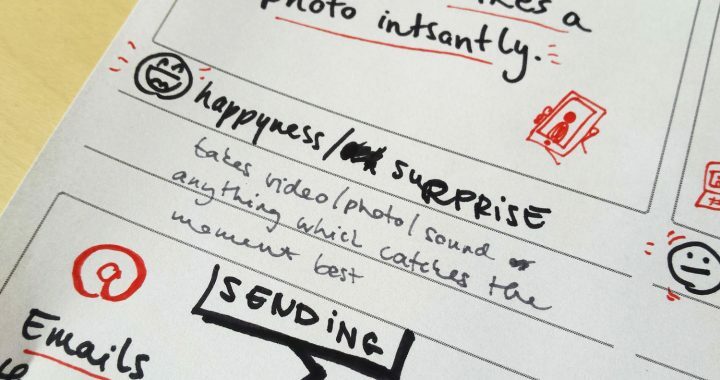 Images on a UX storyboard can speak more powerfully than just words; they add extra layers of meaning. High-level stakeholders or people outside of the design team will process information presented this way much more easily. A UX storyboard focuses on problems and situations rather than features, just like personas or journeys do. But since it does so in a more engaging visual form, people emotionally relate to it more easily. Storyboards let us understand the flows and problems at a glance. Posting them on your team’s wall literally keeps these stories and flows in sight. You might rightly wonder: “Cool, but when should I use this method?” or “Does storyboard creation even suit my product?” In my experience as a UX designer, two typical situations tend to encourage creating a UX storyboard. In creating a completely new product or service, storyboarding can summarize and explain existing user stories and problems really well. After the first user interviews or field research, it can also summarize your findings superbly. In one of our recent projects, I took a research trip to Asia with a fellow colleague from UX studio. We were in the process of creating a financial app, so we wanted to understand how people use cash there. We created some very quick storyboards for ourselves to understand the basic steps of the payment process in different markets and stores. A cutting from the storyboard I sketched this during our Asia trip. We wanted to understand how cash is being exchanged at local a local store. Model the user interaction with a product based on data gathered from user testing, interviews or analytics. Here, we can speak of both existing or developing products. A UX storyboard shows their embeddedness in daily situations, as well as the scenarios where people use them. Example of a storyboard about a user story of an already existing product. 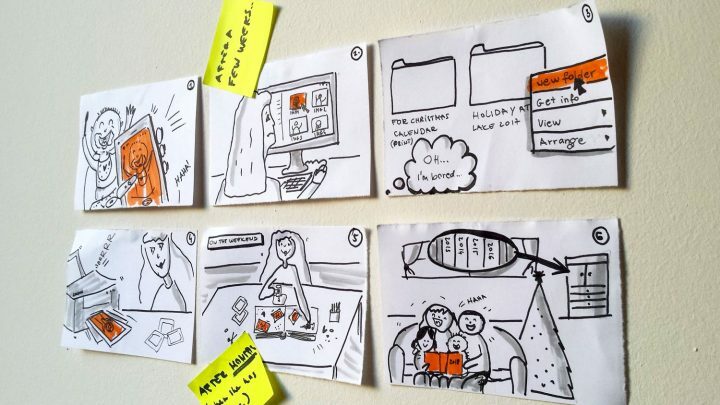 Storyboarding can serve as a useful element to many product design scenarios. In my experience, creating a UX storyboard can come in particularly handy in a few cases. Below, I list two. Keep in mind, however, these examples just begin to cover the versatile uses of storyboarding! The overview of a whole service (when you are not just paying attention to a digital product, but also designing the full online and offline experience of a service such as a museum or a bank) requires several different touchpoints with the users. Where customers interact with a service, scenes will also change some. In these complex situations, UX storyboard creation can help visualize the different scenes and journeys in an easier, more memorable way than plain text-based ones. Including these in creating a user journey makes distinctly visualizing them from the rest of the online interactions harder. In these cases, storyboards can help a lot to visualize these offline events too. Important note: Drawing skills don’t matter! Before starting to craft a first UX storyboard, keep in mind it does NOT require a super-skilled illustrator nor drawing ability at all! We are not aiming for wonderful images. So, what ARE we aiming for? Telling the user story in detail. For that, we don’t need anything spectacular; some easily understandable sketches will do the job perfectly well. Still scared of drawing? Luckily, software for UX storyboard creation exists! SAP has a pretty cool tool for creating printable storyboards. Or use online tools like Boords or StoryBoardThat.com. 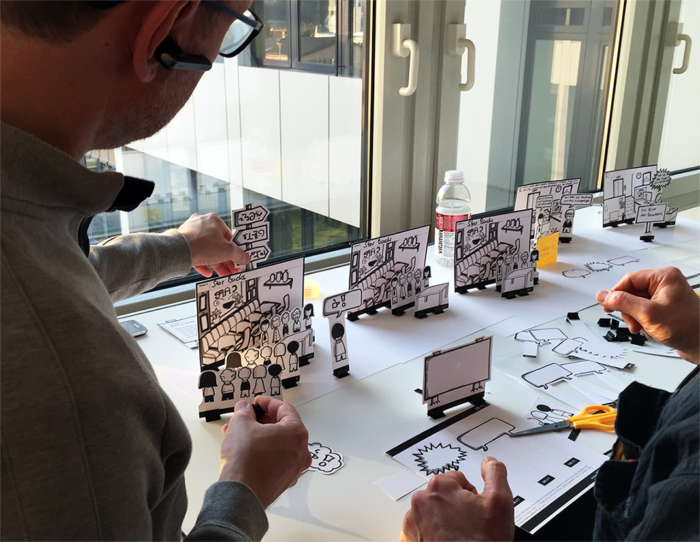 SAP’s printable storyboarding kit. Let the fun begin (without drawing at all)! This real-life example from me, a real-life UX designer, goes through the process of how I created a real-life storyboard. At the time, we at UX studio were developing a photo sharing app for families. A sort of family diary, it forms the 21st-century version of grandma’s dusty old photo album. 1. Step one – Get some data! Just like with user journeys or buyer personas, real data forms the base of storyboarding. This data comes from research. Many UX research methods can collect the adequate data. Read through user interviews, do field research, talk to the super-experienced product team, or compile a bunch of information from any reliable source to gain sufficient knowledge about user stories. 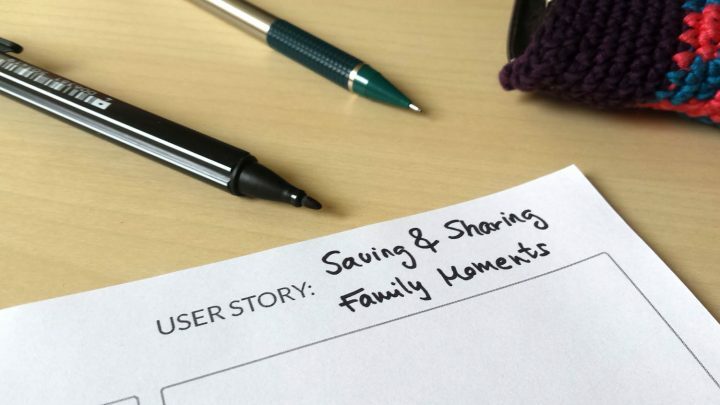 So, before I started making a UX storyboard for the family album project, I read through the research findings our researchers had collected. Choose one of the many different user stories and use cases most important to focus on at the moment. This can also depend on the current stage of the research process. In our case, I focused on how mothers used to save important moments in the baby’s life. I read through all the available information about the process of saving a new memory. Think through the steps and events of the user story. Start working on these basic parts of the user story. The specific persona involved in your story defines the characteristics, expectations and overall attitude of the main actor and can also make the story more lifelike. We used our existing user personas. Think through the places, the environment where the story takes place. The narrative itself. Assemble the list of events, problems, and solutions occurring during the story. Simply writing out the plot steps will help in imagining and looking through the story. 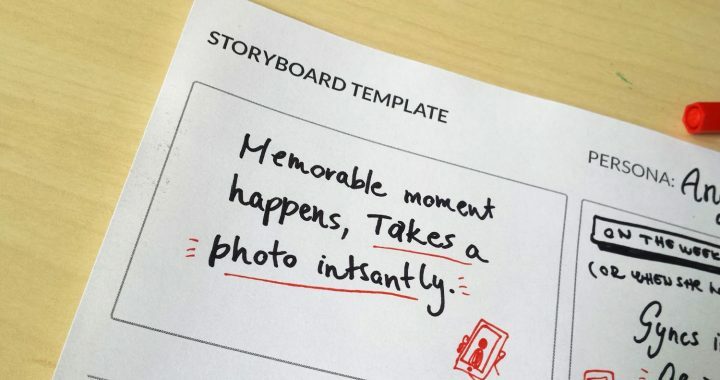 For some guidance at this stage, feel free to download our free Storyboard Template. Emoticons illustrate the feeling the user is experiencing at a given moment. Add emoticons to every step the user takes. Additionally, write down any additional details of importance to add more detail. 5. Step five – Create the storyboard! The time has come to make things happen! Grab a marker or a pencil and draw your story. Create them on separate pages. This allows for easier changes during the process if needed. Add notes to the drawings if further details or explanations are needed. Also, keep in mind that creating storyboards works best involving more people in the process. This helps establish a common understanding of these user stories. I hope you found this guide useful for creating your own UX storyboard! Storyboarding can seem challenging, but it can really help. Not using it as a UXer is not a crime, but it can certainly let us understand our users better and share this knowledge with our team. In need of more UX tools like the free storyboard template? Check out our Resources page! Did you know we wrote a whole Product Design Book on our UX design process in detail? Order it today – with free shipping! Is it a genuine shock to argue we are all designers?